Rich with anti-aging, antioxidant Pomegranate seed oil and Shea Butter, our soothing Lip Butters drench dry, cracked lips in moisture, refreshing and rejuvenating them for visibly smoother lips! 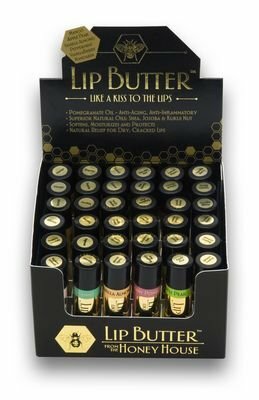 Lip Butters also include Jojoba Seed Oil and Kukui Nut Oil, well known for their replenishing and conditioning qualities that bring moist relief for dry, cracked lips. Lip Butter Tubes are .15 oz each. Assorted flavors include Apple Pear, Chocolate Mint, Mango, Natural, Peppermint, Raspberry Pomegranate, Raspberry Lemonade, Tangerine, Vanilla Almond and Vanilla Berry.